Preparing cooking and serving the most delicious and stunning christmas dinner does not have to be difficult. Allow us to guide you though some very easy steps to take the stress out of your christmas dinner (we have cooked alot of turkeys). 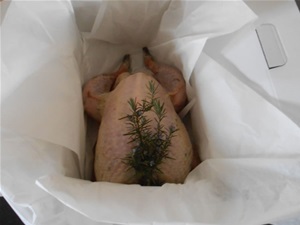 Our turkeys are freshly prepared and are carefully presented in a box, with the added aroma of a rosemary sprig. After collecting your purchase, please follow the storage guidelines below. If Fridge Space Is Not A Problem we recommend that you remove the product from the packaging and place it on a tray in the bottom of a fridge, uncovered, with the giblets. If Fridge Space Is A Problem we recommend that you remove the product from the packaging and put it into the freezer for 12 hours, or until firm. This will not freezer the product, but will reduce the temperature considerably. The giblets can be kept in the fridge. Remove the product from the freezer and put back into the packaging with a frozen ice pack and store in a cool place. If you do not have enough fridge or freezer space, it is essential that you keep the product chilled, with frozen ice packs that should be changed frequently. Remove the product from the fridge or packaging on Christmas morning and allow it to come up to room temperature, before putting it in the oven! 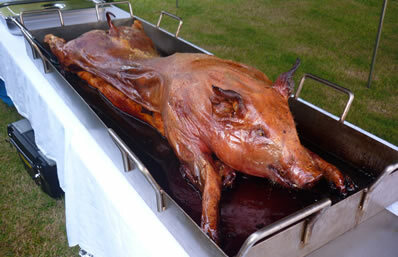 Our produce is prepared freshly for consumption on Christmas or Boxing Day. If you are not planning to eat your product until after these days, it is recommended that you freeze it. This will not affect its superior quality. People often feel anxious about cooking Christmas Dinner, with the worry of ensuring that the meat is cooked properly but with the added concern of not over cooking it! With such a fresh product, an average size turkey will take approximately 2 hours to cook to perfection! Therefore there is no need for the early bird of the household to wake and rise to put the oven on at an unsociable hour! We suggest that you allow the bird to come up to room temperature before you put it in the oven. Pre heat the oven to 180 degress celsius. Place the bird breast side down, which will keep the meat moist as the fat trickles through the breast whilst cooking. 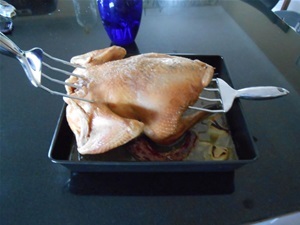 We prefer not to cover the bird with foil as this does not allow for the skin to crisp, or to stuff the bird as this prolongs the cooking time. During about the last 30 minutes of cooking, carefully turn the bird over, season and return to the oven. It is then advised that you check your meat every 10 minutes or so with a meat thermometer, until it reaches 72 degress celsius, in the thickest part of the breast. At this point, remove the bird from the oven and allow to stand for at least 30 minutes prior to carving, which allows the juices to settle into the meat. This makes it easier to carve and enhances the delicious moist meat. 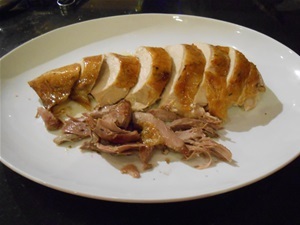 Here are some top tips to make the carving your free range turkey simple! Firstly remove the wings and the legs by cutting through the skin. Next use the tip of a sharp carving knife and cut along the breast bone, keeping the knife as close to the bone as possible, until the breast meat is removed. Slice it thickly and pour over the reheated gravy juices before serving. Delicious!